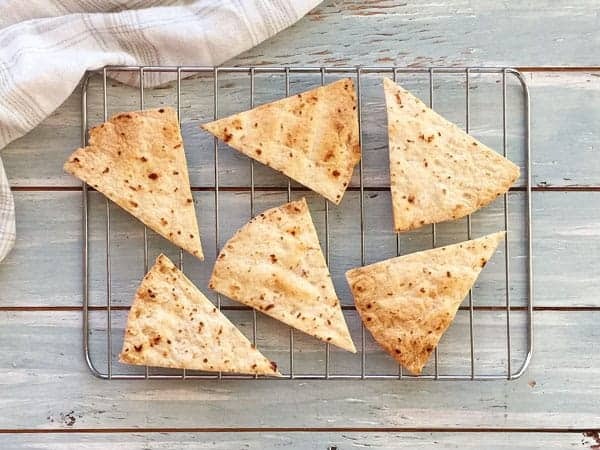 Toaster oven baked flour tortilla chips are the easiest toaster oven snack. They’re a snap to throw together and can be made in ANY size toaster oven with ANY type of tortillas you like. 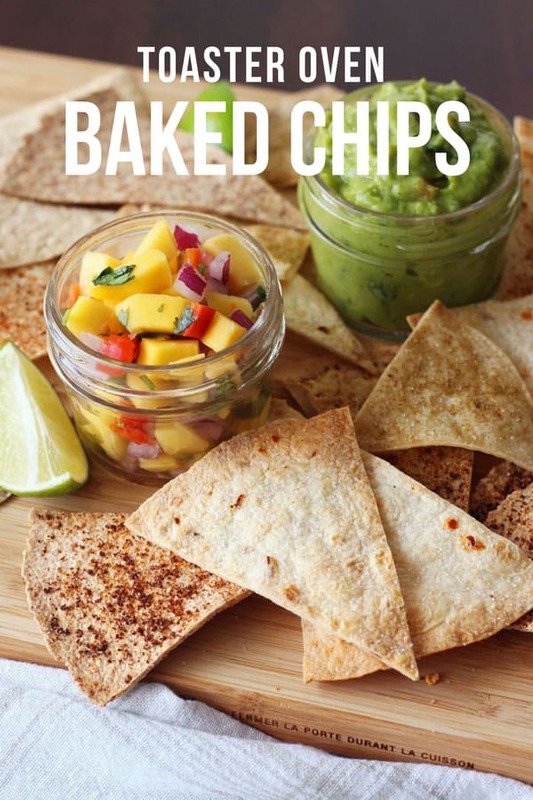 Plus, they taste great and are perfect for dipping in your favorite salsa or guacamole. 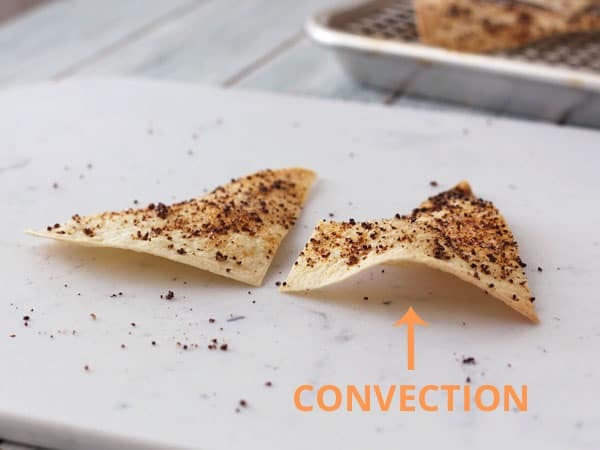 Below you’ll find everything you need to know about baking tortilla chips in your toaster oven, including tips for using convection and alternative types of tortillas! Here’s the deal: Baked flour tortilla chips taste great but they’re nothing like your usual bagged corn tortilla chips. For starters, they’re lighter with a crisp flakiness. I’d rate a flour tortilla chip’s texture as closer to a tasty cracker than an uber crunchy chip. Also, plain flour tortillas don’t taste like much. So you need to be generous with the seasonings (SALT!) 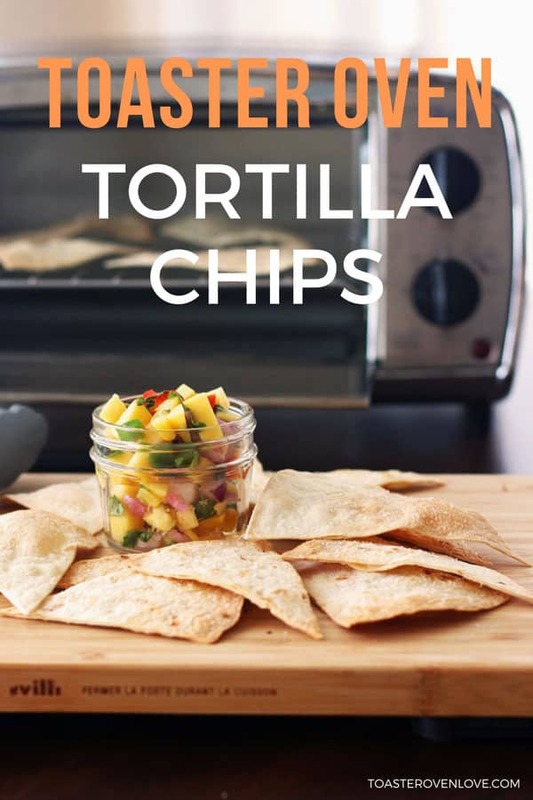 or use a flavored tortilla to make your chips. We’ve baked these tortilla chips directly on the rack in our smallest toaster oven and they turned out fantastic. 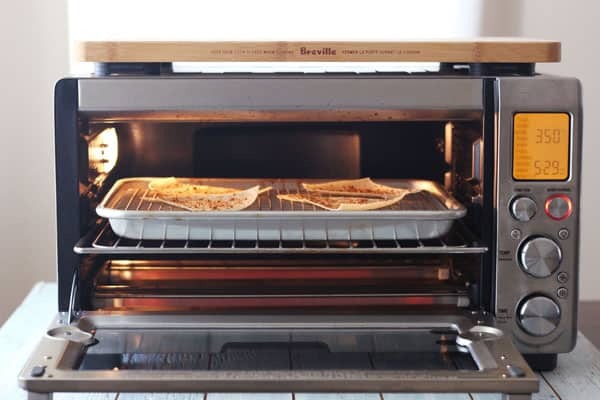 But if you have a larger toaster oven, like our Breville Smart Oven Pro, you might have a problem getting the rack out. That’s because larger toaster ovens usually have catches in the rack guides. The catches help to keep the rack from tipping forward when it’s pulled out. It’s a nice feature to have when cooking heavier dishes but it can make removing a rack full of chips difficult. So for our larger toaster oven, instead of baking chips directly on the cooking rack we like to use a rimmed 1/4 sheet pan and baking rack combo. 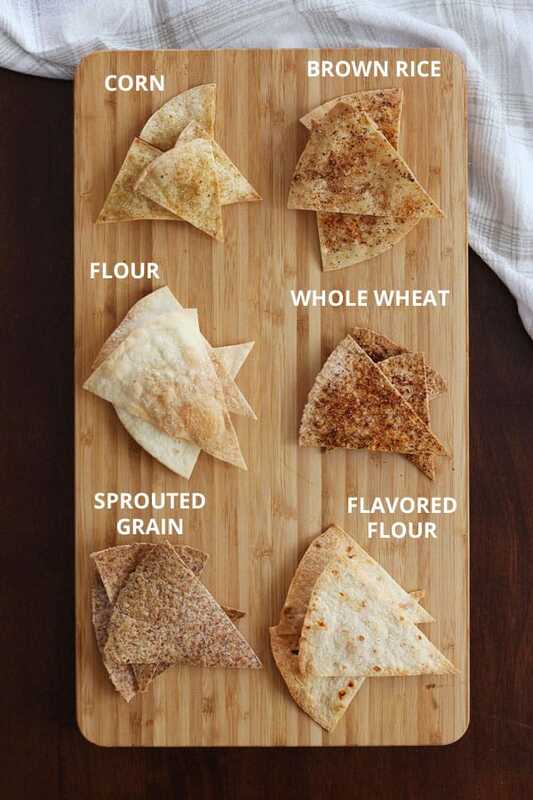 Use this recipe to turn any kind of flour, brown rice or sprouted grain tortillas into a quick and healthy snack treat. Remove your toaster oven’s cooking rack and preheat it to 350 degrees F on the “Bake” setting. Lightly brush or spray one side of the tortilla with oil and season. Flip the tortilla over and repeat. 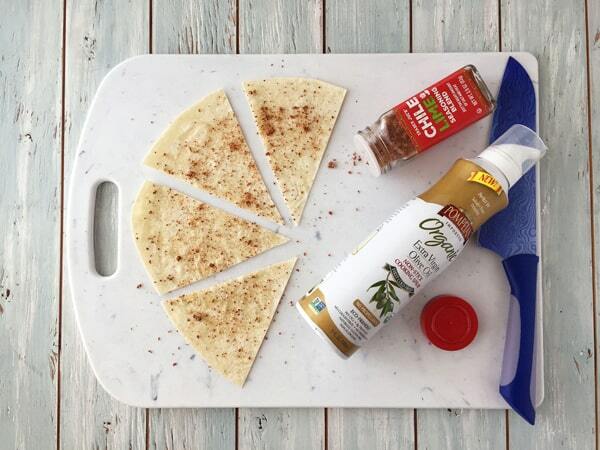 Slice tortilla into 8 or 6 triangles. 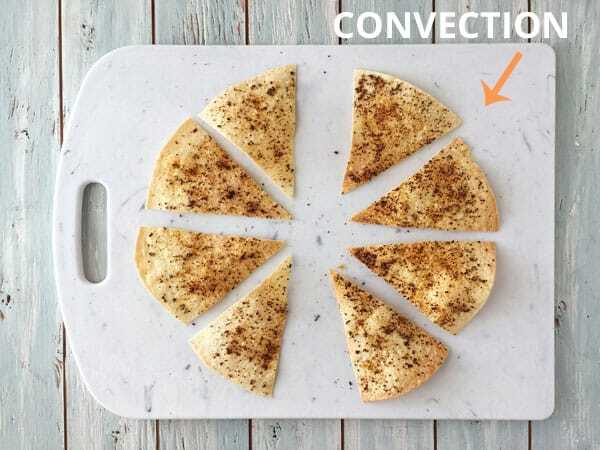 Arrange tortilla triangles on the toaster oven cooking rack in a single (not overlapping*) layer. Carefully place the rack in the middle position of your toaster oven and bake until the chips are lightly browned around the edges and crisped, about 6 to 8 minutes (see note section for cook times). Carefully remove the hot cooking rack and allow chips to cool completely and crisp further before serving. *If your toaster oven is smaller you may need to make your chips in two batches to keep them from overlapping. 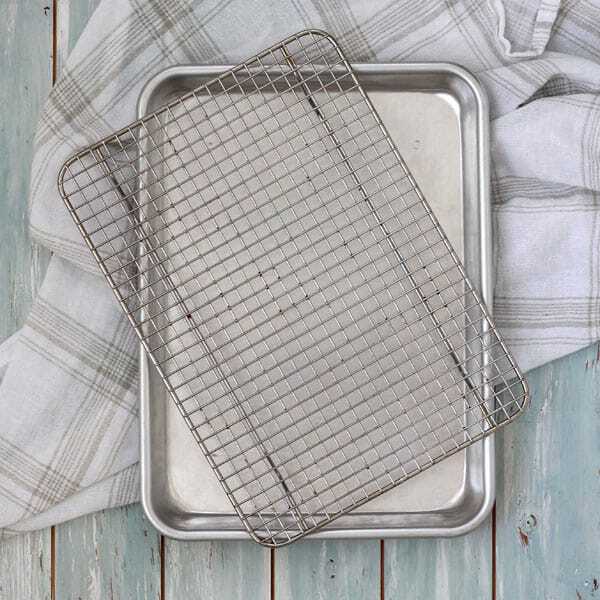 For large toaster ovens: Insert an oven-safe rack into a quarter sheet pan. Adjust the toaster oven’s cooking rack to the middle position. Preheat the toaster oven to 350F. For smaller toaster ovens: If you’re baking the chips directly on the toaster oven’s rack, remove the rack before preheating the toaster oven to 350F. 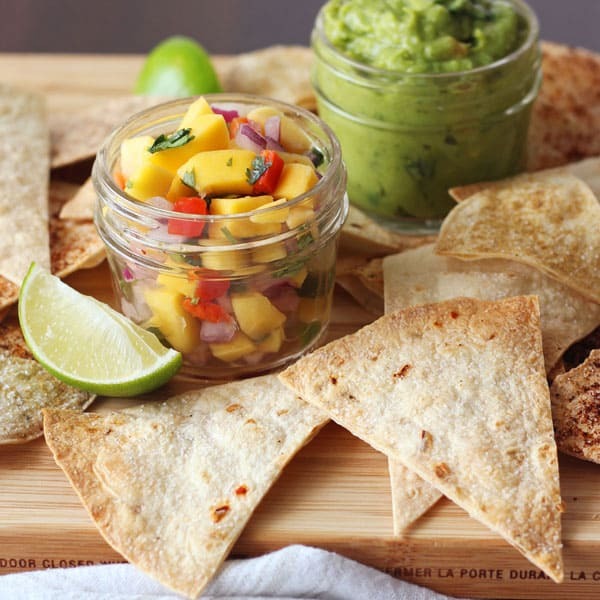 Gather a small cutting board, flour tortilla (any size is fine), oil, salt or your favorite seasonings and a sharp knife. Lightly brush or spray one side of the tortilla with oil and season. Flip the tortilla over and repeat on the other side. Slice large burrito-size tortillas into eight triangles. Smaller taco-size tortillas into six triangles. Place tortilla pieces on the rack or rack/pan combo. Make sure the pieces are not touching or overlapping. If your toaster oven is smaller you may need to make your chips in two batches. Place the pan or rack in the middle position in your toaster oven. Bake until the chips are lightly browned around the edges and crisped about 6 to 8 minutes. Use oven mitts to carefully remove the cooking rack or rack/pan combo and allow chips to cool about 5 minutes on the rack. The chips will crisp further as they cool. Armed with the crazy idea that “you can make any tortilla into a chip” we tried the method above using brown rice, sprouted grain, and whole wheat tortillas. They all took about the same time, except for the whole wheat which needed an extra two minutes. The brown rice tortillas were our FAVORITE. They had a unique texture reminiscent of the baked potsticker wrappers we used for these mini fruit tacos. 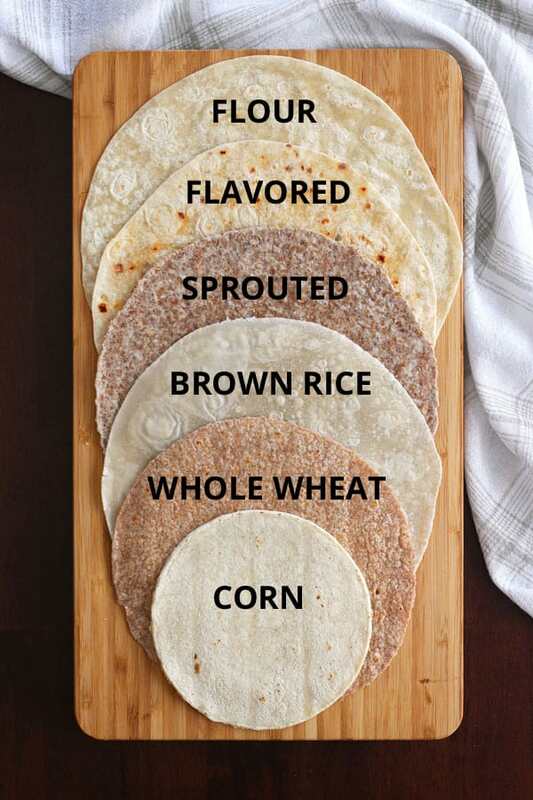 While the sprouted grain tortillas required A LOT of seasoning to have any sort of flavor. Baking with the convection fan on the chips were a tiny bit lighter and less flat. Otherwise, they tasted the same as the flour tortilla chips baked without convection. 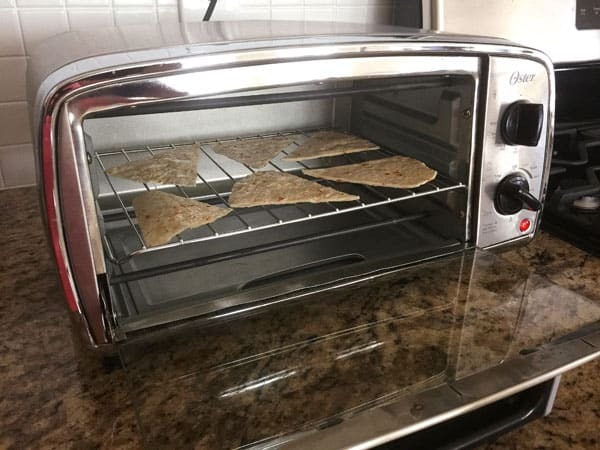 To bake your flour tortilla chips using a convection toaster oven keep the temperature the same at 350°F but begin checking for doneness 1 to 2 minutes earlier. A small batch of crispy crunchy Toaster Oven Baked Corn Tortilla Chips, they’re salty and full of so much cornlicious flavor. Stash a bag of corn tortillas in your freezer so you can have chips anytime you want! Craving a custom chip experience? 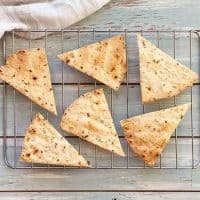 These Toaster Oven Baked Pita Chips are thicker, crunchier and you can make them in 6 different fun and healthy flavors! Kale Chips are light, flaky and super easy to make in your little oven. Each variety of kale, from curly to Tuscan, has it’s own unique texture and flavor, have fun trying them all with our small batch recipe for one. Thank you so much for testing all these, and for the nachos recipe too. You are becoming my favorite source of recipes as we downsize!